These unusual structures are often described as looking like chimneys because of their cylindrical shape and large, round hole in the center. I've always thought they look more like tiny volcanoes built by mud erupting from crater-like holes. Either way, no other animal produces such unique mud structures in Ohio. Native burrowing crayfish in Ohio belong to one of two genera in the family Cambaridae: Cambarus and Fallicambarus. However, last season, we discovered a non-native crayfish belonging to the same family burrowing in the southwest part of the state: the Red Swamp Crayfish (Procambarus clarkii). This crayfish is also called the Louisiana crayfish which provides a clue to its origin. Its native range extends throughout the southeastern United States including Louisiana where it's collected or "farmed" to become the main ingredient in crawfish etouffee. As mouthwatering as that may sound, this highly aggressive non-native has the potential to push-out our non-natives. 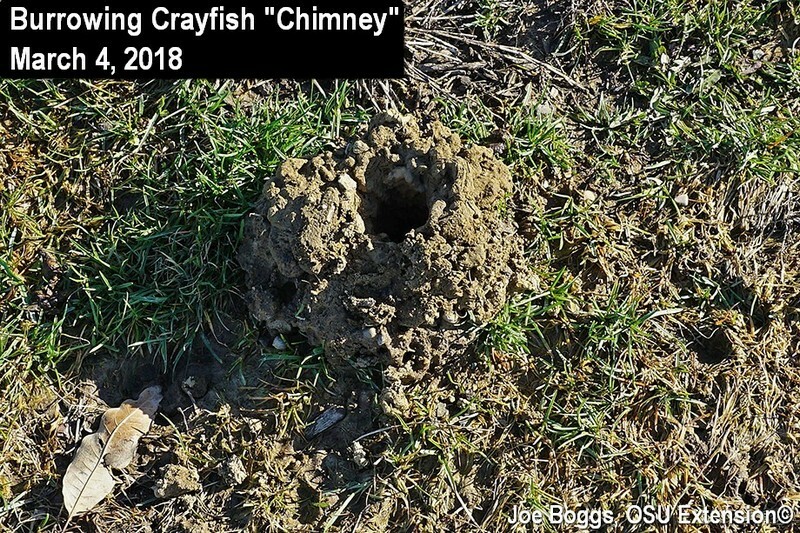 Indeed, my first clue that we were dealing with a different crayfish last season came in the form of observing much higher densities of mud chimneys per square foot compared with what we typically see with our native species. Experts divide crayfish "land-lobsters" into three general categories: Primary, Secondary, and Tertiary, based on the crayfish's life style. However, one size does not fit all; some crayfish don't fit neatly into just one of the three categories. All crayfish are capable of burrowing; even those that live in streams (Tertiary). However, these crayfish only produce rudimentary burrows such as a groove beneath rocks to accommodate a hideout. Secondary burrowers produce more structured excavations, often in stream banks. But their burrows usually involve just a simple single-chambered tunnel from which the crayfish scuttle forth to take a swim. Primary burrowers are the true excavators. Their burrows may include multiple chambers and their tunnels often extend deep into the soil far from streams. Of course, they must reach groundwater because all crayfish breathe with gills. This is why we usually find their burrows in poorly drained soil such as in or near drainage ditches. The life-style of primary burrowers is supported by a number of evolutionary adaptions. Their claws (singular = chela; plural = chelae) are modified for digging. Their abdomens are often smaller than their more aquatic cousins because they don't need powerful swimming muscles. They have bigger gills to support sauntering about on land at night in search of food. The omnivorous crayfish will chow down on both plant and animal food, living or dead. You may find them several feet from their subterranean abodes if you use a flashlight and practice a little stealth. The crayfish throw soft mud up around their exit holes as they excavate the soil. If you look closely, you may see scrapes and groves made by its chelae in the fresh mud. These chimney-like structures may eventually tower 3 - 8" above the soil surface. Unfortunately, the mud chimneys can present a real hazard to mowing. Hitting a sun dried brick-hard crayfish chimney with a mower dulls mower blades, blasts out clay-shrapnel, and sends up huge clouds of dust … often accompanied by a stream of expletives. This makes burrowing crayfish a serious nuisance pest for turfgrass managers. Red swamp crayfish are generally considered Primary burrowers; however they can also behave as Secondary and even Tertiary burrowers; they can thrive fully immersed in water. This crayfish's changeable life-style reflects environmental conditions encountered in the Deep South. During the winter and spring, low-lying land is often flooded meaning it's good to be able to survive in a true aquatic environment. But the water often dries up during the heat of the summer which selects for crayfish that can burrow down to groundwater. This crayfish's switch-hitting life-style provides considerable survival benefits which is one reason it can proliferate in wide ranging habitats. There is little that can be done to directly control this non-native as well as our native terrestrial "mud bugs." DO NOT pour toxic materials down the holes to kill the crayfish because the burrows extend down to ground water; the chemicals could contaminate both well and spring water. Successful management of these sometimes bothersome crustaceans should focus on two strategies: physically reducing the high profile of the mud chimneys by stomping them down before the mud dries; and habitat modification by enhancing drainage in areas with high crayfish activity. Patience is also a virtue because burrowing crayfish activity is most prolific in the spring; mud risings tend to subside as the season progresses.